Ferry Corsten recently revealed the first details of his third extended Countdown, where on June 2, he moves the action to Europe to supply another 8-hour Corsten’s Countdown transmission. Ireland’s national broadcaster, RTÉ will be hosting the event, which will beam out around the world from their Dublin-based studios. 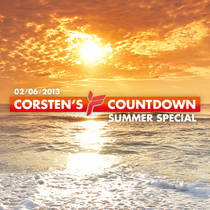 The Summer Special edition of Corsten’s Countdown will be packed with the hottest tracks, drop-ins from surprise guests, ticket giveaways, track and remix premieres, live interviews (with DJs calling in from around the world) and, in the last hour, the Countdown itself. For the event, Ferry not only wants to hear your track requests, but he also wants you to share your favourite summertime memories. If that memory is soundtracked by a piece of music, so much the better - pair the memory with a tune… and share it at corstenscountdown.com. Check the site now for all the latest info.